Join our bloggers as they share their experiences on the challenges and joys of helping children succeed in school. Do You Worry if You’re Doing Enough With Your Kids? Stop! Is it possible that as parents we may actually dread homework more than our kids? Well…don’t answer that out loud. We are here to help make this year different! 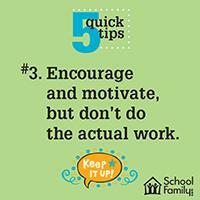 Just focus on these 5 quick tips and you’ll see that you can do it (and so can your child)—without having to fall into a homework abyss. A week from now, I will be an empty nester. Or should I say my husband and I will be empty nesting, for it’s a process, not an identity. It’s another phase of the journey we started when our children were little—slowly but surely letting them go. Though I hadn’t a clue at the time, I started this process on the first day of kindergarten for my older daughter. Apparently, I couldn’t believe my little curly-haired girl could function independently. So I actually got on the school bus with her. I had no idea that parents simply didn’t do that. The bus driver looked at me like I was crazy, and I’m sure some of the bus stop moms snickered. I slowly backed down the two bus steps and watched her find her way to a seat, giant backpack obscuring half of her tiny body as she made her own way. Now I am sending her and her younger sister off to college. Last night, the three of us stood in our basement among bags and boxes of stuff—towels, toiletries, mini ironing boards, shower caddies, under-bed storage containers, desk lamps, comforters, and snacks. I offered my best ideas on packing, but they actually wanted to do it themselves. That’s what’s supposed to happen, right? They’re now taking the lead; I’m suggesting tips from the sidelines. But it took me a while to get there. When my second daughter went to kindergarten, I was a little stronger than when my first one went, so I didn’t try to ride the bus. What I recall is standing with her at the bus stop when she tugged on my arm and said firmly and clearly, “I am NOT going to school.’’ I faltered. Maybe I could drive her? But then I knelt down, looked her in the eye and said firmly, “Yes, you are.” It was the eye contact that did her in, and her quiet acceptance almost killed me. Then there was the year my older daughter started middle school. She was worried about having to use a locker and in particular, remembering the locker combination. So, we bought her a lock and helped her practice over and over, until she probably could have done it underwater and blindfolded. Still, I worried so much that first day and felt no relief until she returned home to report that the locker experience was a breeze. She had moved on, but I felt 10 years older. And then high school. I drove my younger daughter her first morning, feeling overwhelmed by this change. But she was in good spirits for she had connected with friends on Facebook to make a plan for sitting together at lunch. As I pulled away from the drop-off line, I felt buoyed by her mood, until I saw a young man—with a full beard, no less—get out of a car and head into the school. I could not believe that someone who could drive and grow facial hair could be a classmate of my daughter. Somehow, I found a way to keep driving instead of running into the school to warn her about male upperclassmen. Before I knew it, the girls were both finishing up high school. They had their licenses and were driving to school each day. They would whirl around me in the mornings, sometimes asking for an egg sandwich for breakfast, sometimes ignoring me while they argued with each other about who would drive. In a few days, we will pack the car (to the brim). My younger daughter goes first to start her freshman year. Then, two days later, we will again stuff the car and take our older girl, who begins her sophomore year. I will do my best not to overstep, to let them take the lead. And start my own process of empty nesting, the next step in letting them go. 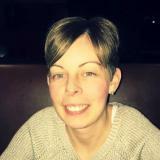 Rose Cafasso is the social media manager for School Family Media, SchoolFamily.com's parent company. She lives with her family in the greater Boston area. Kindergarten is a big step for your young child! 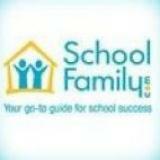 Here are five easy ways to help her become better organized for a successful and smooth home-to-school transition. Create a school night bedtime routine. To the extent possible, stick to a bedtime hour and planned routine on every school night. For example: bath or shower, story, a drink of water, and in bed by 8 p.m. Whatever works best for you family, do consistently on school nights. Allow time for a nutritious breakfast. If time is short, one delicious and fast example that combines carbohydrates and protein could be a slice of whole wheat toast with peanut butter, sliced banana on top, and a glass of milk. Keep backpacks, shoes, lunchboxes, and other items in the same place. For example, have her keep her backpack on a low hook on the back of the bedroom door. Keep her lunchbox in a basket on the kitchen counter, and her shoes in the same spot on her closet floor. Encourage independence. Teach your child how to tie his sneakers so he can tie them at school. Let him practice cutting, with a pair of child’s scissors. Start on old catalogs, coupons, junk mail, etc. Put a small brown laundry basket and a small white or tan one in the bottom of his bedroom closet. Have him put his dirty light-colored clothes in the white basket, and dark-colored clothes in the brown basket. So when it’s time for laundry, the clothes are automatically sorted. Practicing these five simple routines can help your child become better organized, more independent, and experience greater success at school! Are you a parent who would like to help your child’s school? Maybe even help it win $10,000? Enter your school in the Frigo® Cheese Heads® Build a Bright Future Promotion, and you will have a chance to do just that. The promotion entry period runs now through Sept. 30, 2015. Frigo® Cheese Heads® will award three schools a $10,000 prize and another seven schools a $1,000 prize. Parents, teachers, and adults over 21 years old can nominate a school with a short essay of between 50 and 200 words that creatively describes something that would benefit students. Make your pitch interesting! And, it should be something that can realistically be accomplished for $10,000. For inspiration, check out the entries for the 2014 winners! 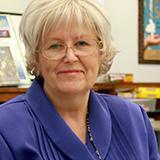 After the nomination period ends on Sept. 30, judges will select 10 entries as finalists. The public will have an opportunity to vote on the finalists from Oct. 12 through Oct. 31. Winners will be announced in late November. Make sure to tell your friends and other parents about this promotion because the more nominations a school receives, the better a chance it has at winning. You could turn a good idea into something useful for your child’s school! Get the details on how to submit a nomination and the contest rules here. Good luck! When did we stop letting our children try because we are too afraid they might fail? The father told him to try his best and hope for the best…That has stuck with me, and the more I think about it the more I smile. I think about my parents who always pushed me and let me try. Did I fail? Of course I did, but I learned to fight harder and want it more. Parents need to offer their children support by encouraging them to try new things, work hard, and do their best. The most successful people are the ones who work the hardest and experience some failure along the way. As Michael Jordan said, “To learn to succeed, you must first learn to fail.” Let your child know that no matter how well he does, you will be proud of his effort and hard work. And, don’t forget to tell him every day how much you love him. Best wishes to all as we begin the 2015-16 school year! May it be the best one yet. Young children don’t have our adult basis of comparison. Often, they don’t know where to start when asked to “be good” or behave. Parents can set up a simple yet very effective behavior management system for home by following some of these simple guidelines that work in classrooms. Consistency. If your child’s bedtime is 8 p.m. on school nights, try your best to stick to it. If he’s resistant or needs to calm down, try reading a book 10-15 minutes before as part of the routine. You can be more flexible on weekends, vacations, etc. Follow-through. Follow-through is the most important piece of any successful behavior management plan. Make consequences fit the expectation, and focus on the positive. For example, “If your homework is done by 5:30, we will be able to play catch before bedtime.” Presenting a child with a consequence and following through helps ensure that your child will take you seriously, and know that you mean what you say. Be kind, yet firm. Children recognize when they are not following the rules. Kindness is often an unexpected and powerful response. One of my favorite quotes is by Mark Twain, who wrote, “One can always show kindness, even when there isn’t fondness.” Responding with a simple, “I’m very sorry that you feel that way, but this is what we have to do.” Or neutral phrases, stated firmly and then calmly repeated, such as “Oh, we don’t do that in room 9” can be very effective. Be specific and don’t mince words. If your child clearly understands your instructions when presented in a calm and direct manner, the chances of cooperation are greatly enhanced! Children across America are returning to school! Summer vacation is over. Most kids stay up late and sleep a lot later in the morning during the summer months. It is now time to start getting used to an earlier bedtime and wake-up time so your children won’t be sleepy and tired the first few weeks of school. A few changes in daily routines during the school year can make this year go more smoothly. Try to keep school supplies organized and in one area. The supplies should include a planner, which is one of the essentials to keep up with schoolwork and commitments. A desk is nice but not necessary. The kitchen table is a great place to study. Inexpensive plastic shoe boxes work beautifully to hold pencils, pens, markers, glue, and tape. Paper can be stacked on a shelf nearby. Binders and notebooks can be color-coded and stored in a book bag along with any homework just completed. Spend 20 minutes every day getting organized. Some students do this without assistance, but if your child is disorganized, she will need your help with this until it becomes a habit. Before leaving for school, she should check her planner to make sure she is taking everything she needs for the day. Before leaving school in the afternoon, she should check her planner to make sure she is taking the correct books and assignments home. And, just after doing her homework, she should put everything she used back in its place. Monitor your child’s time using electronics. Some parents have an additional plastic shoe box where phones go during homework time and when going to bed. Teens should not sleep with their electronic gear nearby. It is very common for kids to text one another off and on all night (check your child’s messages to see when he is texting). Too much light from the screen can also interfere with the ability to go to sleep. Decide together how many extracurricular activities are appropriate for your family and healthy for your teen. Many teens are so booked with activities that they do not have time to do well in school. My rule of thumb with my own children was that they could play one sport or one have major commitment (such as marching band) each season. Once they made a commitment, they had to stay with it until the end of the season. Parents and children should make this decision together, but keep in mind that there are only so many hours in the day! In my student support role, the two problems that come up the most with struggling students are time management and organization. Some students can manage this without help, but many need support to learn how. You can provide daily help until your child begins to manage on her own. Making sure your child has what she needs, teaching her how to keep it organized, and monitoring how she spends her time each day can help overcome these issues. Ideally, summer vacation has been relaxing, less stressful, and more laid back for your child. But now that August is halfway through, is she ready to gear up and start a new school year? Here are 10 easy ideas to help your child boost confidence, brush up on skills, and ease back into a school routine. Practice alphabet recognition. Review the letters as partners (both upper and lowercase together). Teaching the letters as partners is easier—your child essentially learns 26 letters at once, rather than 52 if they are taught separately. Keep practicing until he can identify them randomly out of sequence, as well as in sequence. Make sure she can legibly print her name. An easy way to practice this is to use a highlighter—any color except yellow, as yellow is too light. On a piece of white paper, print your child’s name, starting with a capital letter first and the rest lowercase. With a sharpened pencil, have your child trace her name inside the highlighted letters. The highlight provides a clear border for her to see how the letters are formed. The pencil can easily be seen inside the highlight color. Gradually eliminate one or two of the highlighted letters until she can easily print her name without them. Practice counting orally to 20. Practice both forward and backward, as that will help him understand simple addition and subtraction. For safety reasons, make sure your child knows his full name, address (street number and name, town, and state), and a phone number where you can be reached. Make sure he can identify the five vowels (a, e, i, o, u) and can say the short and long sounds of each. Practice adding to get multiples of 10. Practice counting forward and backwards to 100. This is a great activity to do in the car. When reading stories together ask her to identify characters, setting, and the main idea of the story to check comprehension. Help her go back and reference the story, if needed. Simple review and practice of basic skills helps your child gain confidence and get ready for a new school year, all while having some late summer fun with you! There is much concern about the increase in the rate of children diagnosed with autism (Autism Spectrum Disorder-ASD). The Centers for Disease Control reports that in 2000, one out of every 150 children was diagnosed with ASD, and in 2010, one out of every 68 is diagnosed. This is a huge increase in just a short period of time. There are several possible reasons why there are more now than there were before. Recent changes in the definition of autism (the diagnostic criteria) account for a significant part of the new cases. Children may have been diagnosed differently before the new criteria were published. Studies of where these autistic children live show that they are more concentrated in areas where there are hospitals and clinics. Professionals are available who can accurately diagnose and treat children with ASD, and therefore more children are identified. It is also possible that we as a society are more informed about autism and more likely to seek a diagnosis for our children. Ongoing studies are seeking an explanation for the increase. The child does not communicate and interact with other children as well as expected for her age. Perhaps she is not able to recognize and interpret facial expressions. At least two different types of “restricted, repetitive patterns of behavior” exist. For example, the child may want to play with one toy in exactly the same way over and over again. The symptoms must be present early in the child’s life. An older child may not have the same severity of symptoms, because he has learned how to manage them, but the symptoms existed earlier. The symptoms affect normal day-to-day functioning. There is not a better explanation for the symptoms. For example, the child may have a cognitive disability that better explains his symptoms. To learn more about ASD and what to look for in your child, you might want to read Signs and Symptoms available from the CDC. The diagnostic criteria include a range of symptoms so wide that some autistic children function very well with proper training, yet others will never function well. The earlier a child is diagnosed, the quicker he or she can get help. If you have concerns about your child, a visit to the pediatrician is the first step. What Pet Should I Get? Is Finally Here! As a parent and a 1st grade teacher, I’m a huge fan of Dr. Seuss. I could not wait for the release of his new book, What Pet Should I Get? And I am delighted to say it was worth the wait! Common sense wins out after the children consider buying one of each kind of pet. “Dad would be mad.” Yet, then the pressure is on, “If we do not choose, we will end up with none.” Their final choice of a pet will probably puzzle young readers (and some parents, too). However, their final selection takes a back seat to Dr. Seuss’ lessons on the decisionmaking process, the ability to find compromise, and being able to develop a positive resolution while the clock is still ticking. This is a book that can inspire long periods of discussion between young readers and parents. It should prompt many questions that can be asked by children to adults, and vice versa. 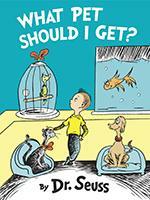 Like all other Dr. Seuss books before it, What Pet Should I Get? is a true childhood adventure. Years ago I took a course called Using Legos To Teach Physics. We built all kinds of machines using basic Lego pieces and electric motors. We learned some simple programming so that we could direct our machines to do work. For example, one challenge was to build an electric wheelchair and a ramp for the wheelchair to navigate. I entered the class skeptical about the value of the class; but by the end I was convinced that this was a valid teaching tool that students could use to learn physics and engineering concepts. My confidence grew along with my skills to meet the challenges presented. Legos are now used in robotics competitions across the nation and everyone agrees that students learn a tremendous amount building with them. The game of Minecraft is similar to Legos in concept, and teachers are using it in their classrooms to teach virtually every subject. Minecraft has been described as “virtual Legos” by experts who recognize the value of teaching with it. Like Legos, Minecraft is not free; however, millions of adolescents are playing it and connecting with their friends online to play together. Since Minecraft is a virtual game, the blocks can represent a lot more than real Lego blocks. In Minecraft, blocks represent things such as water, coal, stone, trees, and even food like carrots and potatoes. Players use blocks to build other objects they might need such as a bed to sleep in or a pickaxe to mine blocks. You can play in a survival mode or simply build whatever you can imagine. Science Friday, a Public Radio show, recently featured Minecraft on one of its podcasts (go to Science Friday and search for Minecraft). A mother called in to report that after visiting a ruins site, her sons and his cousins were able to explain how the ancient people must have lived, why the ruins were arranged the way they were, where they probably got the stone, and where their water probably came from. The boys continued their discussion for weeks after the visit. She believed they immediately grasped these concepts because of their experience with Minecraft. If you are thinking about purchasing a video game for your child, you might want to consider Minecraft. It is likely that she will be using it in school in her science or social studies classes! Many skills in early education rely on the sense of sight, hearing, and touch. Incorporating another approach to these senses, while teaching a certain skill, can provide a young child with an alternate way to learn and remember. Here is a terrific game that uses the sense of hearing as a learning tool involving counting and simple addition. You’ll need an empty, clean metal can (soup, coffee, etc.) and 10 pennies. If your 3- to 5-year-old is just learning how to count and understand what the numeral means (known as one-to-one correspondence), try this. Have him sit with his back to you. Ask him to listen carefully as you drop pennies one by one into the can so they make a distinctive sound as they hit the bottom. For example, drop one penny, wait a second, drop the next penny, wait, then drop a third. Then ask, “How many pennies are in the can?” He should be able to say “three.” Help him count out the pennies, if needed. On one try don’t drop any, so he can begin to understand the concept of zero. Play often, until he can easily identify 0 through 10. Once he is very fluent in identifying numbers up to 10 by the sounds of the penny drops, introduce simple addition. Make sure he cannot see what you are dropping—he should be relying on what he hears. Drop two pennies then ask, “How many are in the can?” When he says “two,” say, “OK, now I’m going to add some more. Listen carefully.” Then drop three more and ask, “We had two, I dropped three more, how many are in the can now?” He should be able to answer five. If he has trouble, let him take out the pennies and count them—first two, then three, and say 2 + 3 = 5. Practice often, with all the different multiples between 0 and 10. For example, drop 5, then 2 for 7. Drop 1, then 6 for a different way to get 7. Drop 1 than 1 more to equal 2. Drop 2 then zero for a different way to reach 2. Drop 5 than 5 more to equal 10 or drop 1 and 9 more for another way to total 10, etc. In the next few weeks I’ll share how to increase the difficulty of this game by adding dimes, to practice counting by tens and to understand the place value of tens and ones. Recently, a friend of mine posted on social media that she has a terrible time reading menus. Several of her friends agreed for a variety of reasons. One reason mentioned is that she is dyslexic and has problems with sequential processing. The organization of menus is often non-sequential with interfering information near the essential information. In addition, the fonts used are difficult to read. A second reason is simply related to the paper and size of font. Small fonts on shiny paper are difficult to read for everyone in dim lighting. Menus, as well as many other documents, would be easier for struggling readers if they were created using the newest fonts designed especially for people with dyslexia. One such font is called Dyslexie and is available to individuals for free (schools and businesses pay a fee). A second choice is called Opendyslexic and is available to anyone for free. What makes these fonts better for struggling readers? First of all, each letter in the font has a distinct shape. In most fonts, the letters “p, q, d, and b” are shaped exactly the same, but are in different orientations. In many fonts, lowercase “L” and uppercase “I” look exactly the same. In the specialized fonts, each of these letters has a distinct shape and if reversed or inverted, they would no longer be the same letter. Second, the bottom of each letter is slightly thicker which tends to cause the letter to “stay put” on the line. Dyslexic readers often report that letters seem to move around on the page. In fact, when I asked a dyslexic what she thought of the Dyslexie font, the first thing she mentioned is that she loved how the bottom of each letter is “weighted.” Third, these fonts have longer stems on certain letters, again making it less likely to reverse or flip a letter that is shaped similarly. Finally, the spacing between words is larger than typically found in most fonts, and the beginnings of sentences are automatically bolded. This makes it easier to see the beginning and end of each word; and, the beginning of each sentence is clear. There is some scientific research and much anecdotal evidence that supports the use of these fonts for dyslexic readers. Many report that they read faster and more accurately. It may be time for restaurants to consider producing menus for those who need a little assistance with reading. My friend reports that when she can’t read, she feels anxiety and shame. If your child feels anxious about reading, he might find that the font helps him read better. He can convert digital content for school into one of the new fonts. It is as simple as selecting the content and changing the font. If online, he can copy and paste into a word processor before changing the font. Perhaps, he will be able to read more independently and feel more confident. It doesn’t cost anything to download one of these fonts and give it a try! If you are going to the park, take some favorite books along, for both you and your child. After she plays on the swings, slide, or monkey bars, together take a 5-minute reading break, on a special bench or in the shade under a tree. Depending on how long you are at the park, take two, three, or more reading breaks in between play. When you join in the break, you are subtly reinforcing the importance and enjoyment of reading. On a nice night, set up a small tent or make one using a sheet or blanket in the backyard. Grab a flashlight and your child’s favorite bedtime story (or stories) and read them in the tent before going back into the house to bed. At the pool or beach, stretch out on a towel or blanket for a “read and dry” break. Challenge her to use her finger or a stick to print a new word (that she has just learned) in the sand. Have a “Book Club Play Date Break.” When your child has a friend over for a play date, have the children take a short read-and-snack break. Let them take turns reading a page of the book to each other. After reading, while they’re having a snack, encourage them to talk about the story. Ask simple questions like “What was your favorite part?” “Where did this story take place?” “Who was the main character?” etc. By being creative and making reading part of everyday activities, reading becomes a memorable aspect of summertime fun! 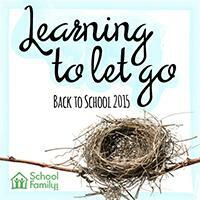 Many families are getting ready to go back to school. It is important to give some thought to appropriate clothing to wear. Most schools have a dress code; and, most adolescents don’t like it! Schools have dress codes for a reason, and it helps to understand why. Here are some ideas for talking with your child if she does not agree with the school’s code. Understanding why dressing appropriately is important can make back-to-school shopping easier! First and foremost, ask her, “Why do you go to school?” Generally, kids will say two reasons in this order—“to see my friends” and “to get an education.” The social aspects of school are extremely important, which is why attire is so important to teens. Your conversation can center on the primary reason for school—to prepare her for her future, whether that is college or career. School is her job right now, and most places have dress codes for their employees. Second, talk about the importance of first impressions. It can be the deciding factor of who is chosen for a job or elected to an office. I like to find pictures online of people dressed up for a party, dressed for working in the yard, dressed for a casual get-together with friends, and dressed for the swimming pool. Ask your son why the people are wearing what they are wearing. Ask him what people would think if he showed up wearing his swimming suit at school or the clothes he wears while mowing the lawn. Ask him to pick out a successful businessman and why he chose the one he did. The bottom line is that how you look makes an impression on others and that impression can affect success. Last of all, make the point that the way we dress affects how we behave. Talk about what happens in school on “dress-up” days. We have a spirit week when students choose themes each day such as dressing like your favorite super hero or wearing school colors. Students enjoy each theme and love that the dress code is relaxed to allow hats, flip-flops, and ragged jeans. Teachers report that it is difficult to get students to take their learning seriously when Iron Man and Batgirl are sitting in class or one student is wearing a bright green hat with blinking lights on it. On normal days, when students are dressed for school, students settle down to business much more quickly. Dress codes do matter. It is a part of our adult life as much as it is life in school. Getting an education is your child’s job right now. Dressing appropriately sends the signal to others, both peers and teachers, that your son or daughter is there to learn as much as possible and that they take their jobs seriously. Take time to examine the school’s dress code and to have this conversation before shopping for school clothes. Bring math into your child’s daily life this summer to keep skills current. Here are three simple and fun activities to practice math that your child learned this past school year. Here is a geometry activity that I’ve done many times with my 1st grade students. They love the hands-on practice of making real shapes. You’ll need a container of plastic drinking straws and some bendable twist-ties from plastic storage or trash bags. Use the straws and ties to construct two-dimensional shapes (polygons). For a triangle, use three straws and three ties. Connect the ends of each straw by inserting a tie about halfway into one straw, and then the other half of the tie into the next straw. They will bend at the corners to form and hold the shape of a perfect triangle. To construct a square and a rhombus (diamond), your child will need four straws and four ties. For a rectangle, six straws and six ties are needed. You’ll need a deck of playing cards with all face cards removed. Use the aces to represent numeral one. This can be for two or more players. Shuffle the deck and put it in a pile, numbers down. Players take turns, picking two cards each. They add the number value of the cards to get a total. The player with the highest sum wins all the cards. To break a tie, each player takes one more card and adds that to the total. When the pile is gone each player counts their cards. The player with the highest number of cards wins. Call attention to clocks you may see around your neighborhood. For example, look for analog or digital clocks on banks, stores, billboards, and other community places. Ask him to tell you the time he sees displayed. Help him, if needed. At baseball, soccer ,or other timed games that you watch, help her read and understand how much time is left in the half, or until the end of the game. Usually, these clocks count “down” so this can be a good time to help her practice counting backwards. Try to find other opportunities involving simple math skills to challenge your young student as often as possible. In her new book, Getting Real, Gretchen Carlson tells a story about her son. His hockey team had just won a tournament, yet he didn’t seem as happy as his mom expected him to be. He told her that everyone on the teams got the same medal—even the fourth place team received the same medals as his team did. This has been a common practice for many years in children’s sports, because parents do not want their children to be disappointed or to experience failure. Carlson goes on to say, “Losing is hard, but it’s as important for kids to experience having to cope with failure as it is for them to win. When we praise mediocrity and give everyone a trophy, children don’t learn how to deal with setbacks.” When children are protected from ever experiencing failure or disappointment, they might feel they don’t need to work as hard. It doesn’t matter as much, because the end result will be the same. Here are some ideas for ways to encourage your children to do their best in all situations. Encourage resilience. When your daughter fails, encourage her to give it another try. Let her know that failure is a normal part of growing up. If she doesn’t get a part in the school’s musical, she needs to figure out why. She can talk to the director to find out the reason. If she learns that she must know a few basic dance steps to be in the school’s musical, then she can work on that. Perhaps she needs some voice lessons. Be careful that she accepts the result graciously and knows that it does not mean anything about who she is as a person. It just means she didn’t get selected for this one part. It is important that she try again if being in the musical is important to her. Help set reasonable goals. It's good for teens to have goals. They often need help, however, in coming up with goals they can actually reach. A child with attention issues should not set a goal that he will never talk to his friends in class, because it is unlikely that he will be able to do that. He can say that he will move himself away from his friends in class and work to reduce the number of times his teacher has to call on him to be quiet. He may need help figuring out how to measure his success. Perhaps he can ask his teacher to give him feedback once a week. In weeks when he does not meet his goal, discuss it together and encourage him to keep trying. Parents can help their children learn to work hard. Learning to praise only when it’s well-deserved is an important step. Teaching them to be resilient—to keep trying even after a failure—will help them understand the need for hard work. Finally, parents can help their children set reasonable goals and encourage them to work hard to reach their goals. Earlier this summer, my husband Brian and I took our 20-month-old granddaughter to her neighborhood playground. She loves to climb up the slide ladder and giggle her way down the slide. She was wearing a new baseball cap that Brian had brought her. As she climbed up the ladder, the brim of the cap was getting caught in the rung just above. She quickly stopped, looked up, lifted her hand and turned the cap around, so the brim was in the back. Then she was able to keep right on climbing! I was amazed at how quickly she figured out the problem and solved it. When I told that story to an educator friend, he reminded me of what good intrinsic knowledge she demonstrated. Intrinsic knowledge is simply defined as occurring as a natural process, or instinctively knowing something. Often, it’s what you know without even realizing you know it! For example, in infants it’s the startle reflex or being able to self-soothe and go back to sleep. In older children, one example is balancing when learning to ride a bike. Create play environments with lots of opportunities to practice visual, auditory and hands-on learning. Tools like books, puzzles, Legos, paper, markers, crayons, listening, music, dance, and board games tap into all types of learners. Observe your child in this play environment and see what she naturally gravitates toward. Help her activate and build on prior knowledge and natural curiosity. For example, if he’s a dinosaur lover help him use and expand that knowledge to reading, writing, math and science. When a child has a genuine interest, he is more likely to do well and stay with a task until finished. Recognizing and making the most of your child’s intrinsic knowledge will prepare her well for a lifetime of learning. Human beings need the attention of others. We need to interact with one another and to feel accepted and loved. When teens misbehave, they often do so to get the attention of their peers or the adults in their lives. Years ago, an acquaintance talked for 20 minutes about how awful her daughter was without ever saying anything good about her. I asked her, “Do you ever just put your arms around her and tell her you love her?” She said that she didn’t do that because her daughter didn’t deserve it. To me, it partially explained her daughter's behavior. She needed to feel loved by her mother and to have her mother’s unconditional love. Since she couldn’t get that, she at least got her attention by misbehaving. There are times when parents must discipline their children, but children must know that their parents love them despite their poor behavior. How can parents let their kids know how much they love them even when they need to change their behavior? First of all, parents and teens need to talk to one another often. Ask your son his opinion about important decisions you need to make or what is going on in his life. Ask him probing questions that require more than a one-word answer. Tell him how important he is to you and how much you care about him. If talking to each other like this is normal, then talking about his misbehavior won’t be so stressful. He will already know you love him, because you have told him so many times before. Second, be aware that your daughter hears what you say about her to your friends. If you need to discipline her about something, do what you need to do and move forward without continuing to talk about it. Tell others about the positive things she is doing and how proud you are of her. When she gets positive attention from you and hears you telling your friends about the good things she does, she will know that you forgave her and that you still love her. This will encourage her to behave well because she gets lots of attention for it. 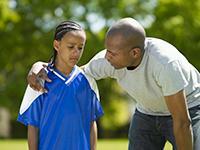 Finally, learn about ways to manage your son’s behavior effectively. There are many excellent books about how to change behavior without using humiliation or other extreme measures. 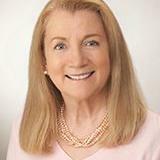 My favorite is Joanne Nordling’s Taking Charge: Caring Discipline That Works at Home and at School. Nordling outlines a behavior management system based on consequences tied to the behavior you need to change. She also recommends that you carefully choose which behaviors get attention and which do not. Very deliberately, you effectively shape your son’s behavior in positive ways. Teens need the attention of their parents. If they don’t get enough, they might do something wrong to get negative attention; negative attention is better than no attention. To change this dynamic and strengthen your relationship with your child, talk often, use effective disciplinary techniques, and choose your words carefully when discussing family business with others. Most important of all—make sure she knows how much you love her. Oh no! It’s finally summer vacation, and the weather forecast is calling for rain all day. But don’t let a rainy summer day spoil any fun. Use it as an opportunity to talk about and examine the wonderful natural process of rain. Start this science dialogue by asking your child “What do you think causes rain?” Then do a simple experiment that I’ve done with 1st grade classes over the years. Help your child create indoor rain! As the drops grow and get heavier, gravity will cause them to drip down. He’ll then see how it starts to “rain” inside the bag! Children get really excited by this experiment. It’s a perfect opportunity to segue into what happens in nature, and explain about the water cycle. Just like the water in the bag, the sun heats up oceans, rivers, lakes, ponds and even puddles. The water evaporates and collects in the atmosphere as moisture particles grow into clouds. When the clouds get too full, the drops become heavy and fall back to the earth, creating rain. Then when the sun comes out, the process starts all over again. Here are five books with great pictures and vocabulary that help youngsters understand the water cycle. Most should be available from your local library. A simple, hands-on activity like this makes understanding science very real for a young child.